I should begin with a quick apology. This column will have its fair share of ranting. I have grown increasingly frustrated with those who feel Shanahan will set back the franchise again if Beck fails. Even more so, however, by those who believe the Redskins should have gone a different direction last April. I am sorry Jason Reid, but I rarely agree with you and your past article, “They Better Be Right on Beck”, is wrong. Mike Shanahan had to roll the dice with what we had at quarterback in order to keep his blueprint intact. They were the best options we had at the time and it remains that way. I hear people say we should have done this or that, but Shanahan stuck with them because he did not want to sacrifice the future of the Redskins. Going after a quarterback would have jeopardized what he is trying to fix. He is not going to lose his job, or the respect of Snyder, because he did not go after a quarterback. He made the right moves for the organization. Trading down for Ryan Kerrigan and not taking Blain Gabbert was the correct move, end of story. Gabbert may end up being a quality starter in the NFL, but the Redskins need for youth and defensive help outweighed the quarterback position at that time. Countless media outlets, experts, and the Gab (myself included) all agreed the ‘Skins made the right decisions and were lauded for their ability to stick to a plan and not go after what they coveted. To many times the ‘Skins have gambled and lost. Reid’s column puts the pressure on an unproven field general and fails to point out the positive changes that have occurred inside Redskins park. He is simply writing what we already knew in a sense. While ignoring the positives, he discusses a position that Washington hasn’t had any success with since Rypien and how another failure will set back the team. Thanks for the heads up. That is something that hasn’t been written before…He is not the only one jumping on this train. Everyone loves to discuss the quarterback situation in DC. Charlie Casserly, I have news for you…you are not the GM anymore and you would have steered the Redskins down the wrong path. 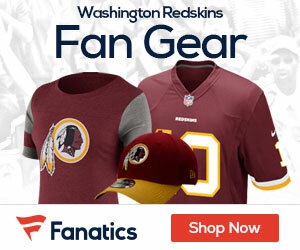 The former leader of the Redskins recently made the news by stating Washington should have drafted a quarterback. While these are not the exact words of Reid, they echo a similar sentiment. As I have touched on, the feeling before and after the draft was the Redskins needed to address other issues. They did those and the team has greatly improved. I understand the quarterback position is the most important position on the field and Washington needs to fix it, but this is a 3 year plan and will take time. Washington has followed Shanahan’s guiding hand and despite a few hiccups, McNabb, fields a team that is competitive and hungry to win. The feelings of optimism in the preseason should not go away because of a few poor games by Grossman. We knew Grossman was going to implode at some point. We also knew that Shanahan was going to give a Beck a chance at some point. Yet, despite all the positive energy surrounding Washington early on, the national media is fueling an uprising in the district because their is another potential QB controversy. Even the always talking Joe Theissman wanted a piece of the action when he spoke his genius thoughts about GROSS-man. My problem is this: We all know the Redskins need a quarterback. That’s been a problem for the greater portion of my life, but not everything can be fixed right away. Mike Shanahan will get his man. Building through the draft is a proven winner and that is what the Burgundy and Gold are doing. They addressed their defense this past season and as a result we are going to be competitive nearly every Sunday. That’s just step one. Zorn and co. left Shanahan a disaster and he is on his way to cleaning it up. 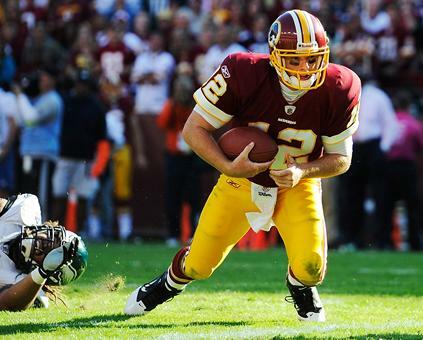 Between Sports Illustrated and Sporting News, the Redskins were supposed to win 5 games total. They already have 3 and are going into week 7 with a winning record. Not bad for a team that has not had stability at quarterback in years. Bottom Line, the Redskins will be fine. I have said it in nearly every article I have written, this is not a playoff team. Shanny may not have the quarterback everyone wants, but look at the foundation. They are leaps and bounds ahead of where they were. To the national media outlets out there who write and cover the skins… Take a step back and see what is going on in DC. Santana Moss wanted to come back and he has never had a stable quarterback. Jamaal Brown wanted to be here because he believed there was something special going on. Fletcher routinely talks about the improved locker room. The list goes on and on. The culture is changing, now lets see what happens and not jump ship after a couple poor outings from someone we knew would blow a game eventually. Thanx for acknowledging my GROSS-man stik. ALLEN is the magiciaan that will be pulling the proverbial top-tier QB out of his silk top hat, and without surrendering too many top draft choices. But a close second is the need for three top offensive linemen at center, right guard, and right tackle. We have three players that can mix and match with WILLIAMS and LICHTENSTEIGER. Their names are BROWN, MONTGOMERY and CHESTER, but an upgrade at each of their starting positions is needed before a top QB is dismembered playing behind them as starters. Add a W-ILB beast of a player in the draft while extending ROCKY MAC to play inside or out, a cover corner FA with skills to replace BUCHANON and demote BARNES to #4, and a young stud DE to replace SCOTT while moving GOLSTON down a notch, and you’ve got a potentially championship squad. No need for another WR at this time, because SHANAHAN still hasn’t been able to evaluate what he’s already got on hand. The GROSS-man hasn’t been able to locate his passes close enough to them to tell how good they are at this point. BECK will be charged with that duty now. We can use another tight end in the draft as Captain CHAOS has accumulated too many hits to have much more of a future as a starter. I wish him a speedy recovery because he’s sorely needed in this offense.